I was so lucky to be able to stand up for one of my best girlfriends as a bridesmaid in her wedding. I was also very happy to make her “something old” and “something blue” Of course I took this chance to spin the most beautiful yarn and weave something amazing for my beautiful friend. Rebecca is not unique in her wool allergies- and it’s combined with the most sensitive skin, so I’ve always spun for her the softest fibers. For her wedding, I pulled out all the stops. I used 70% bamboo, dyed in the softest barely blue. I carded it on my Strauch Mad Batt’r, with 25% GradeA White Mulberry Silk, barely blue firestar and just a touch of blue opal angelina.I pulled out from my stash a handful of different size vintage Swarovski crystals in aurora borealis. 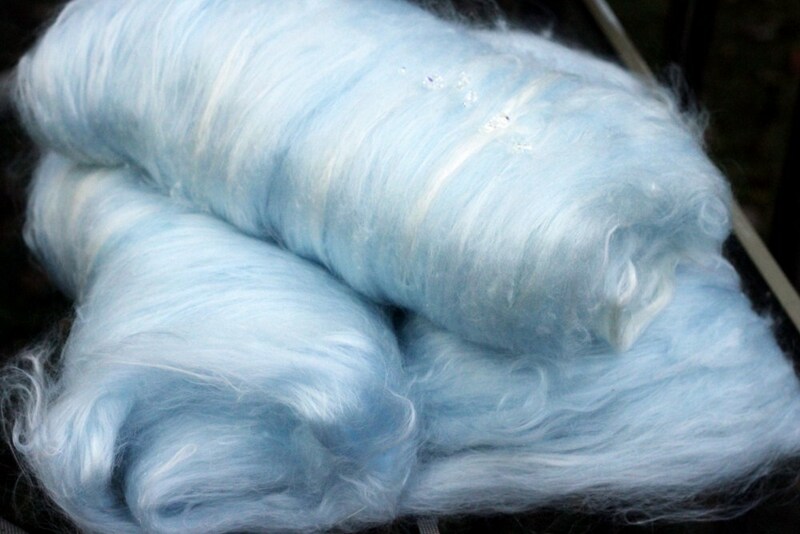 I corespun the yarn around a silk weaving core. I couldn’t use mohair since even with the non wool cover, Rebecca is so sensitive I couldn’t risk it. This did make for a more difficult spin, since the fiber AND the core was very slick- making for a super slippery spin. As I spun, I added the crystals, so they float along the yarn. I weave on a 7ft adjustable Triangle Loom made by Looms by Jim at Sunflower Fibers. They are wonderful looms and I really love mine! For Rebecca (who is on the Petite side, I wove on the 5ft setting. I really think that weaving is the best way to showcase art yarn. You don’t loose any of the beauty or texture of the yarn in a “stitch”. You have maximum control of the look and how the yarns are showcased. I just think I’m addicted to weaving! I use both the Triangle loom and a RH, Ashford Knitters Loom. 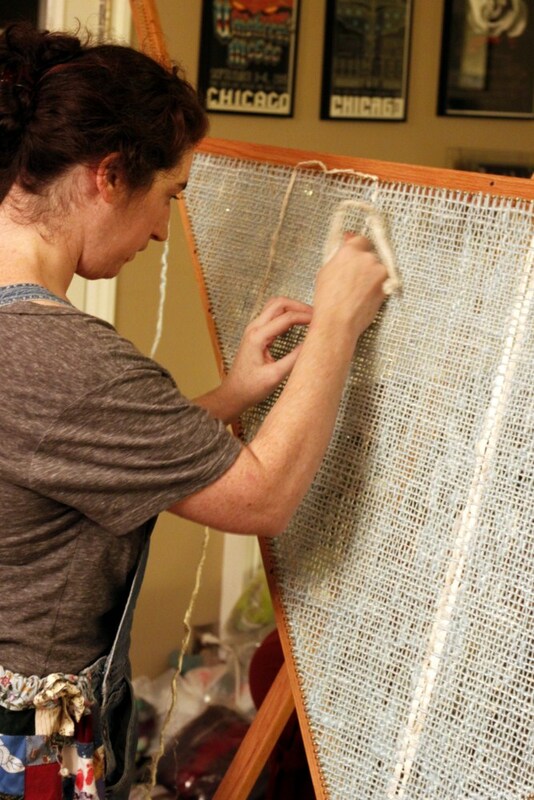 I have a Rectangle loom on my “wish list” for the holidays! My “long term” saving goal is a SAORI loom, which is a full bench loom, perfect for my freestyle of weaving! Once I got all my spun yarn woven onto the loom, I began to add the details. 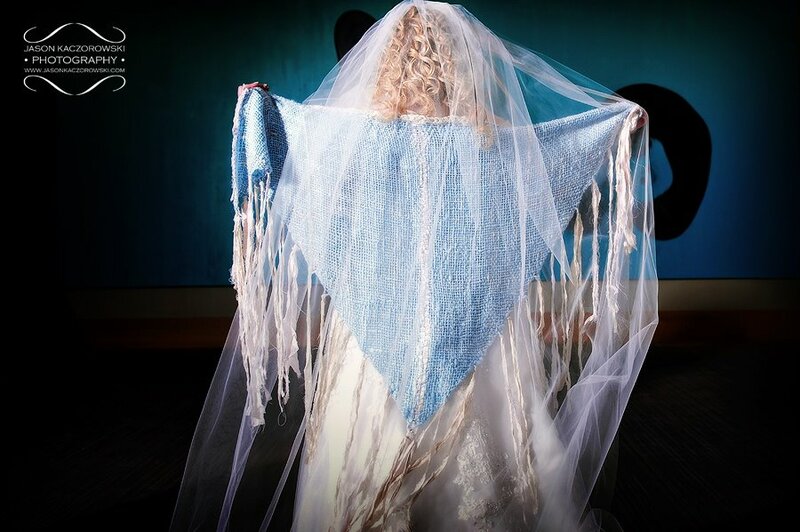 I wove into the shawl vintage white “ribbons” of velvet, satin, duponi silk, silk charmuse, sari silk, and silk chiffon. After I wove the ribbons into the shawl, I used them for fringe. Then I finished the shawl by crocheting the white ribbon along the top edge. After washing the shawl is truly incredible! The drape and handle is just magnificent! The sparkle from the crystals is totally perfect! Just what I envisioned! As I hoped, the bride loved it, and she looked stunning! I can’t wait to make more of these! I had visions of white silk with crystals, or carbonized black diamond bamboo with smokey topaz crystals…. I will be taking custom orders for them as well.. white silk with crystals of the bride’s wedding color. Turn around time is 6 weeks from order. 50% down payment due at time of order, the rest upon completion. Contact me for pricing info! 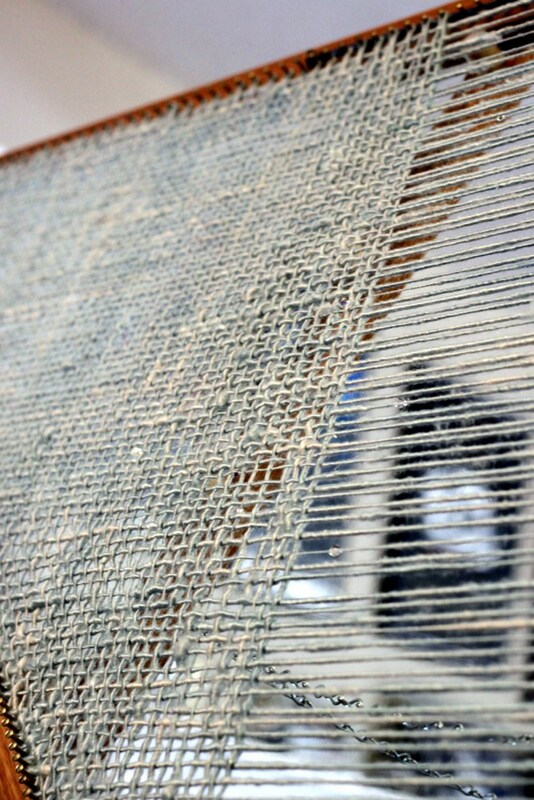 Back to my loom for the weekend.. I’m working on something winter neutral…. ← Post SAFF Shop update!! This shawl is absolutely stunning! I’m blown away that you are able to not only weave such a gorgeous garment but that you spun the materials to make it! Amazing talent. Hullo, your work is just gorgeous! I was wondering if you would have any advice for a novice weaver: I’m doing a continuous weave on my triangle loom and the weft sides keep curving inward. What am I doing wrong? !